Our Kentucky electrical CE courses are approved by the state to satisfy your continuing education requirements. 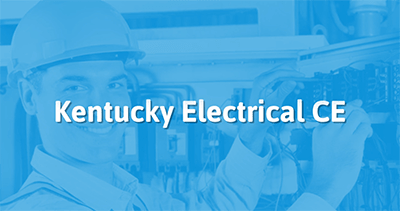 Complete the continuing education to prepare to renew your KY electricians license today. All of our courses can be completed At Your Pace Online to help you meet the state's requirements. Once you finish your class you will have an official certificate of completion to save for your records, and we will report your course completion to the state for you. All individuals holding an Electrical License (EE or ME) are required to obtain 5 hours of continuing education on the current NEC and 1 hour on the NFPA, totalling 6 hours. Contractor Electricians (CE) are required to obtain 6 hours in business related courses. Our Contractor Electrician Courses have been designed with those requirements in mind! If someone holds both an Electrical License and Contractor Electrician License then they will be expected to take a course for both licenses, 12 hours total. This course is designed for Journeyman (EE) and Master (ME) Electricians to meet your complete continuing education requirements by covering changes made to Chapters 3 & 4 of the 2017 NEC. The course has been approved by the Kentucky Electrical Division and will be reviewing code for the following subjects wiring methods and materials, equipment for general use, and a review of NFPA 70E. This course is designed specifically for Contractor Electrician (CE) licensees. It will satisfy 6 hours of your continuing education requirements. This course is approved by the KY DHBC (BCE) and includes business contracts and digital marketing. Our Kentucky continuing education courses are done At Your Own Pace. This course is designed specifically for Contractor Electrician (CE) licensees. It will satisfy 6 hours of your continuing education requirements. This course is approved by the KY DHBC (BCE) and includes liability & risk management, professionalism concepts, and NFPA 70E - High Voltage Safety. Our Kentucky Electrical continuing education courses are done At Your Own Pace. This course is designed for Journeyman (EE) and Master (ME) Electricians to meet your complete continuing education requirements by covering changes made to Chapters 1-2 & 8-9 of the 2017 NEC. The course has been approved by the Kentucky Electrical Division and will be reviewing code for the following subjects general & definitions, wiring & protection, communication systems, tables & informative annexes, and a review of NFPA 70 E.
This course is designed specifically for Electricians (EE & ME) licensees that also hold a contractor electrician (CE) license. It will satisfy the entire continuing education requirement to renew your licenses. This course is approved by the KY DHBC (BCE) and includes the 2017 NEC Code Chapter 6, changes to the National Fire Protection Association (NFPA) Code (1 hour), marketing & sales, OSHA 1926: safety and health regulations for the tradesman. Our Kentucky Electrical continuing education courses are done At Your Own Pace! This course is designed specifically for Electricians (EE & ME) licensees that also hold a contractor electrician (CE) license. It will satisfy the entire continuing education requirement to renew your licenses. This course is approved by the KY DHBC (BCE) and includes 2017 NEC Code Chapters 1, 2, 8, & 9, changes to the National Fire Protection Association Code (1 hour), business contracts, and digital marketing. This course is designed specifically for Contractor Electrician (CE) licensees. It will satisfy 6 hours of your continuing education requirements. This course is approved by the KY DHBC (BCE) and includes marketing & sales and OSHA 1926: safety and health regulations for the tradesman. This course is designed for Journeyman (EE) and Master (ME) Electricians to meet your complete continuing education requirements by covering changes made to Chapter 6 of the 2017 NEC. The course has been approved by the Kentucky Electrical Division and will be reviewing code for the following subjects special equipment and a review of the NFPA 70E. The Office of Housing, Buildings & Construction has approved your application to become an Electrical Continuing Education Provider to teach Contractors Continuing Education Online only. Under KRS 227A.100 (7) requires six (6) hours continuing education with only two (2) hours safety. Our office requires a letter every three (3) months stating that you want to continue teaching your courses; Mike Melvin is the approved instructor. Your approved classes are KY Electrical Contractor Package 1 which includes: High-Voltage Safety, Professionalism Concepts, and Liability and Risk Management; KY Electrical Contractor Package 2 which includes: Marketing and Sales, and OSHA; KY Electrical Contractor Package 3 which includes: Business Contracts and Digital Marketing. You will need to e-mail stella.ginn@ky.gov the completions of any students for Kentucky. If you need further information please contact Tina Quire or Stella Ginn at 502-573-2002.